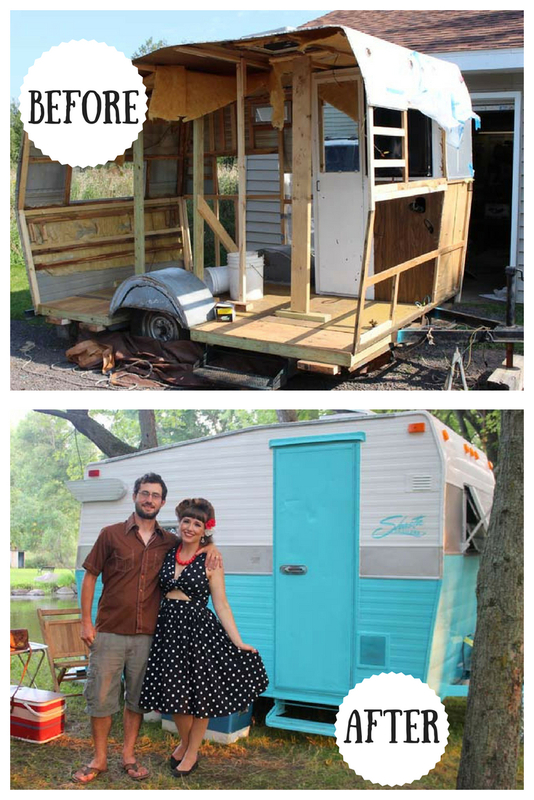 I've been so excited to share more about our 1972 Shasta Compact with you! And this has been a long time coming. 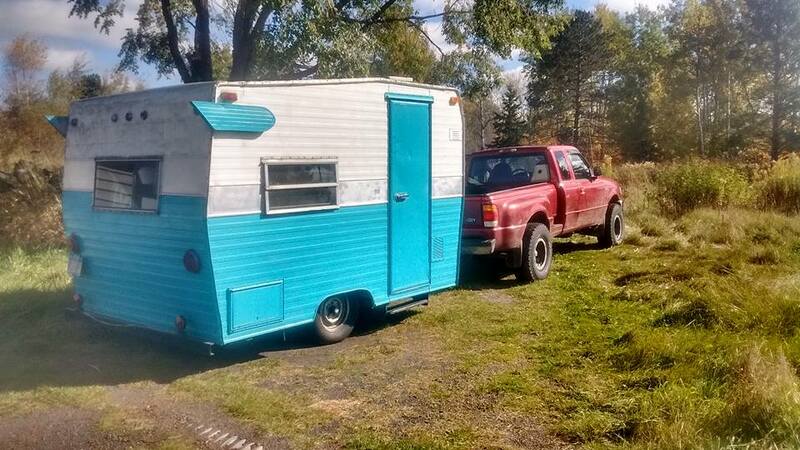 We bought the Shasta back in fall of 2016, fresh faced and wide-eyed. We finished her in summer of 2018, hard and jaded. Ha! Just kidding. We love her. But damn, we learned a lot. The day we brought her home! I'm just going to get one thing out of the way right away. 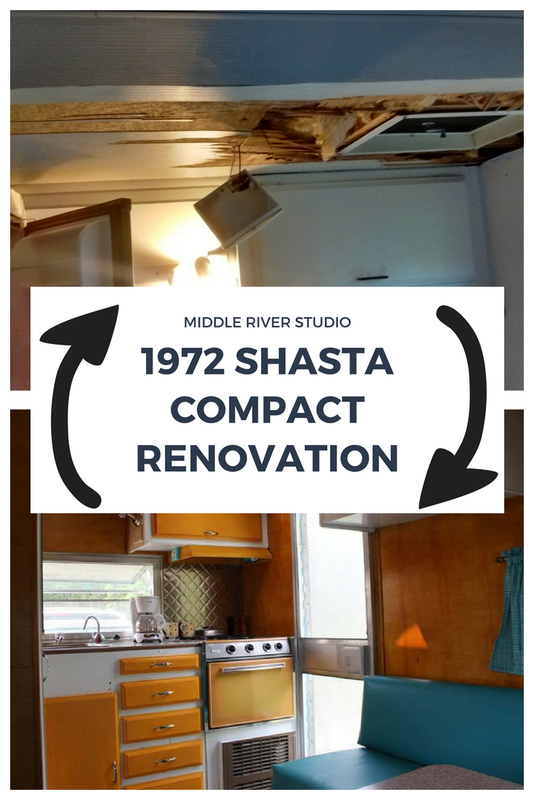 Whenever I talk about the Shasta renovation, I'm going to say, "we" a lot. But it's more like, "we" as in, Mike . . .while I corralled two toddlers, and later (since the project took so long), a preschooler, a toddler and a baby. It's safe to look at it like Chip and Joanna Gaines . . . We talked about all the aspects together, he did the heavy lifting , and then I came in at the end and made sure everything looked cute. 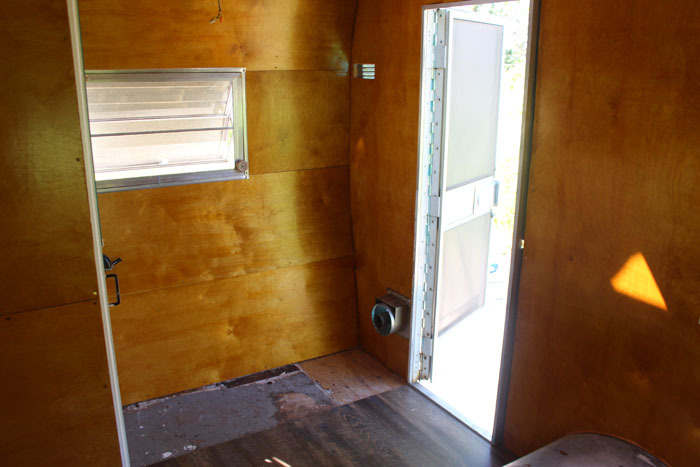 Fixer Upper: Travel Trailer Edition, anyone? Anyway, now that I have that off my chest. . . This is part one of all the details of the renovation: the interior. I'll have another post next week about the exterior projects. When we bought the sweet little thing, we knew there was some water damage on the roof (around the roof vent-- a common spot) as well as one of the back corners. The previous owners fixed the water damage by putting up some nice sheets to cover it up. Ha! They had repainted everything white (covering the original dark fake wood paneling) and teal. 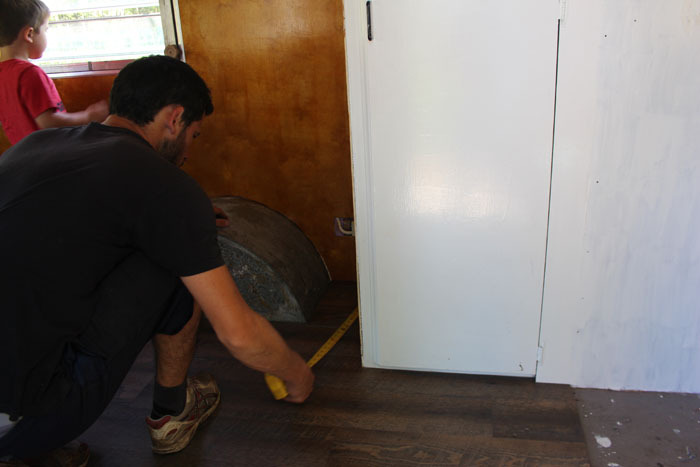 They had also been part way through covering up the original flooring with black and white laminate tiles when we bought it. There was no table, and instead, they left the benches pulled out all the time, with a mattress on top. 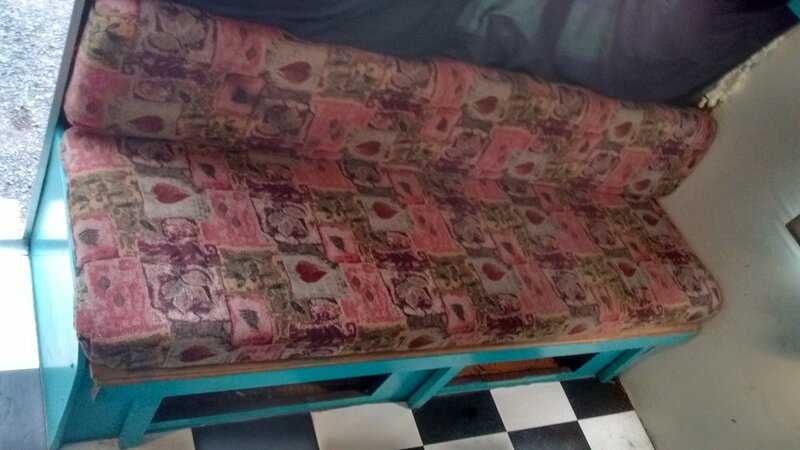 So, the cushions on top were extra ugly, since they were always covered up with a mattress. All in all, she had a lot going for her. After 45 plus years, a lot of things can get broken or lost, but a lot of the original materials were still there, which Mike and I appreciated-- the screen door, hub caps, door handle, stove, light fixtures, furnace, the wings. 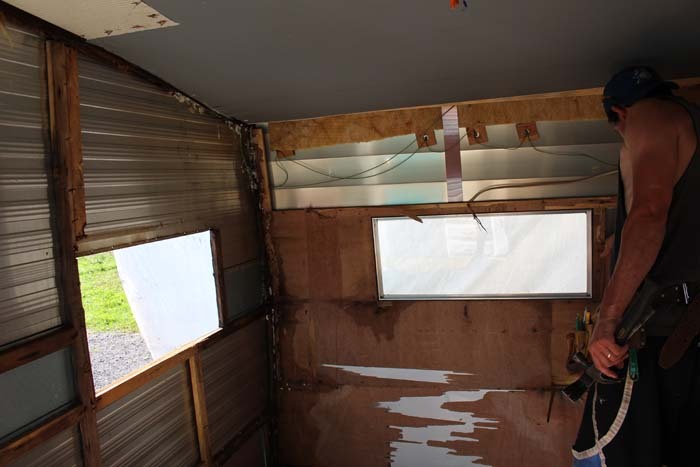 Of course, like basically every Shasta project camper that I have ever heard of, there was more water damage than what we realized. Quite a lot in the back corner, actually, which effected both the back wall and the wall with the door. Then, also below the window on the wall with the electric plug and the water intake. Soooo, we ended up completely rebuilding the majority of the walls. We like to call this picture "ground zero". It's amazing how little actually held these little campers together. Hopes, prayers, and a questionable frame of 1x2s. Rebuild the walls, obviously, ha! Which included re-insulating and Shellac-ing them. Paint stripped the stove, clean it and put in new lines to the propane tank. 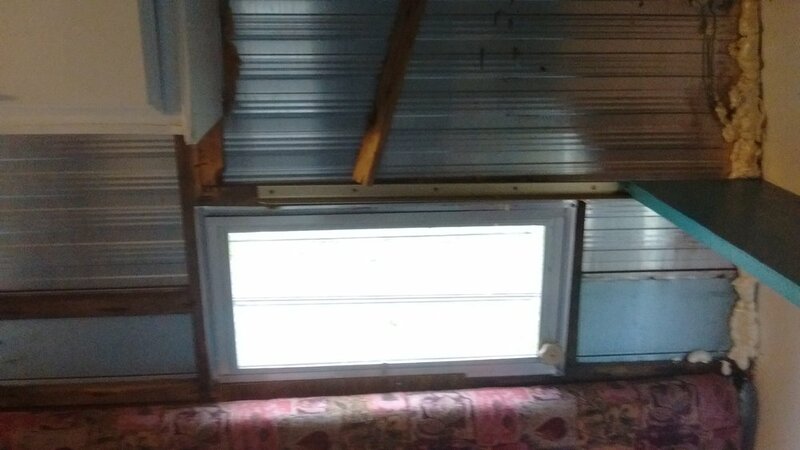 After the walls were rebuilt and re-insulated, we finished them with 3/16 inch birch paneling (which we got at Menards). As a 70's model, our walls would have originally been the dark fake wood paneling. We decided to go with the warmer look of the earlier models, with the birch and finishing it with Shellac. 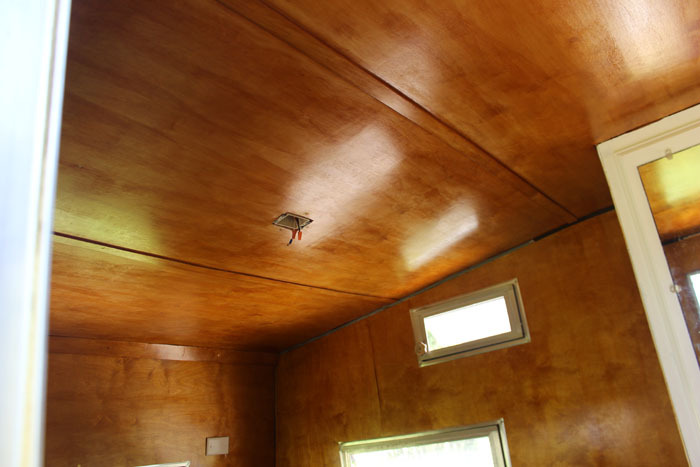 We did 3 coats of amber and then one coat of clear. I love the birch/Shellac walls. It really brightens it up and makes it feel more open compared to the original paneling. There are two faucets- one is if there is a hose hooked up directly, and the other is a pump faucet for the water tank. I looooove having the original stove color! It has some nicks and dings, some spots where the enamel is worn, but it's all part of the charm, in my opinion. The previous owners had painted it teal, and I was so happy with how efficiently the paint stripper took it off. 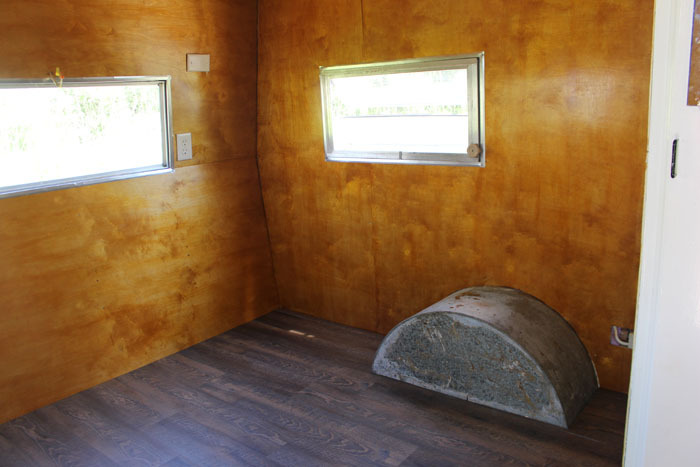 With all the work we put in making this thing look cute, I just couldn't keep that ugly black fridge, so I ordered this orange one from Amazon (they also have a bunch of other fun colors if you want one for your camper!). I think a fun colored fridge is an absolute must. The original here would have been golden yellow, and propane. When it's bedtime, the table comes off, and the benches slide out, to have two beds. 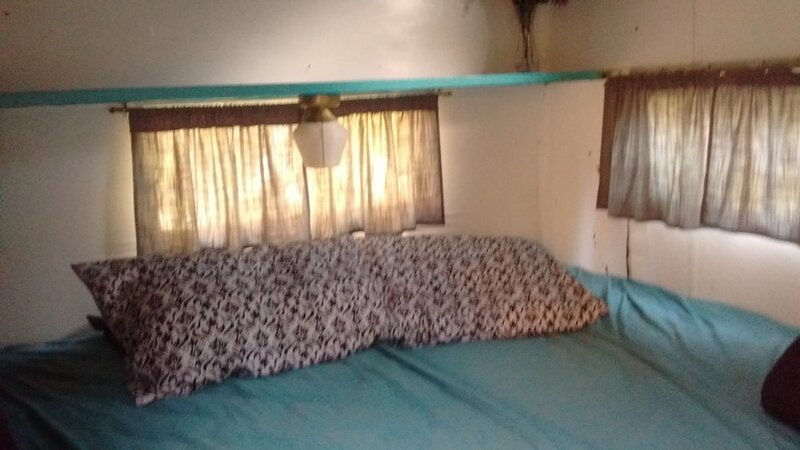 The camper originally had a bunk as well. There was a lot of talk about whether or not we should make a bunk, given the fact that we have three kids, but we decided to skip it . . . we were too nervous about it with our rowdy bunch. So, there we have it, folks! An awful lot of work jam-packed into a 65 square foot space, ha! 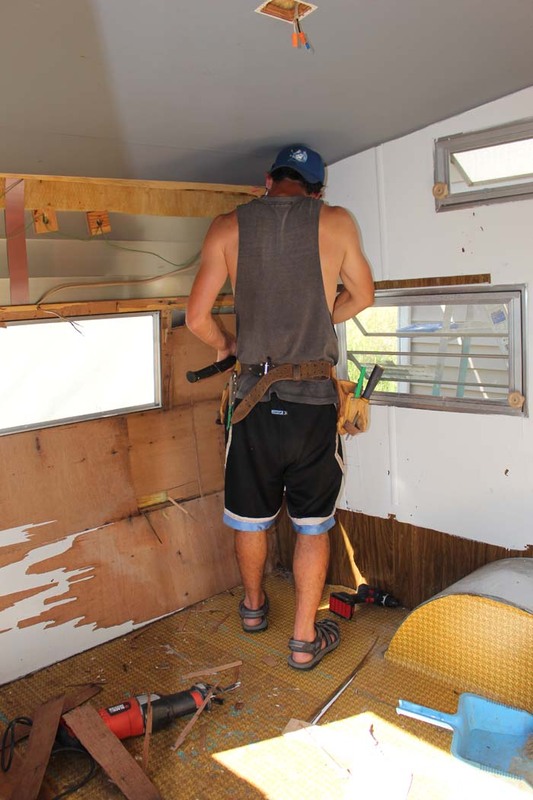 But, not too bad for our first camper renovation, in my opinion! We aren't purists by any means, but we do aim to keep the vintage charm, while also making things practical and keeping in mind that we are DIYers, doing 100% of the work ourselves. 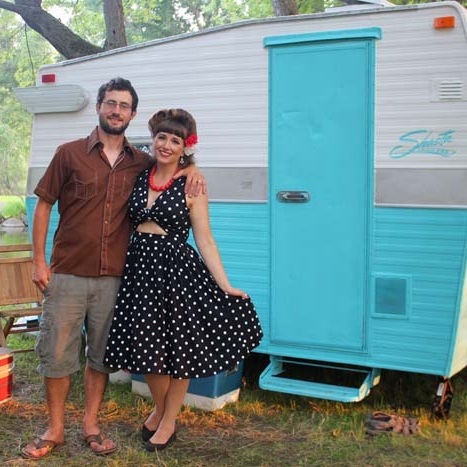 Vintage Trailer Supply was definitely a great help for so many of the projects!